Orange After Dark (OAD), the late-night entertainment program offered through the Office of Student Activities, has an amazing lineup of spring 2019 events. Favorites like snow tubing and trivia night are back along with exciting new experiences like a night at Apex Entertainment Center and a Murder Mystery Dinner at Spaghetti Warehouse. OAD is especially excited for its brand new event at Apex Entertainment Center. Apex Entertainment Center is a new action-packed venue coming to Destiny USA. Syracuse University students will have an exclusive night at the new facility everyone in Syracuse is waiting to experience. 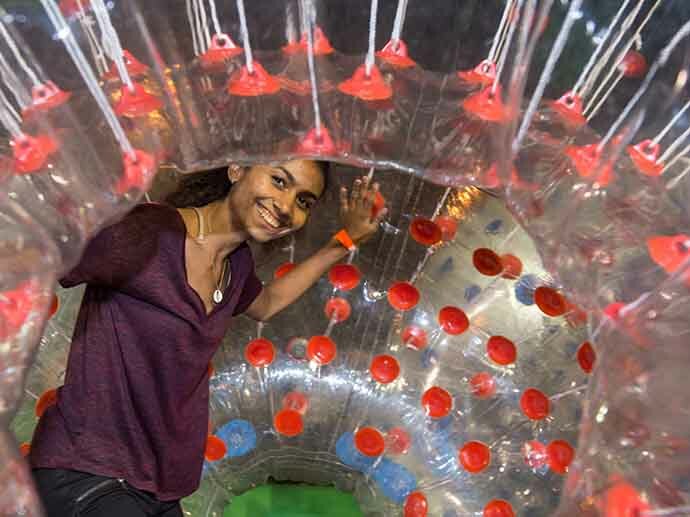 The night will include multi-level laser tag, bowling and bumper cars. This fun-filled event is Friday, March 29, at 10:30 p.m.
Coming off last spring’s success of the “Black Panther” premiere, OAD has two private premieres at Regal Cinemas in Destiny USA of the highly anticipated “Captain Marvel” and “Avengers: Endgame.” The premiere of “Captain Marvel” is Thursday, March 7, at 10:30 p.m. The premiere of “Avengers: Endgame” is Thursday, April 25, at 10 p.m.
With another incredible line up of events and growing popularity, OAD events are expected to sell out. Students are encouraged to the OAD website for more information about tickets and transportation. While some events require tickets, others do not. Some events are free to attend while others require a $3 fee. Tickets are available at the Schine Box Office for undergraduate students two Mondays before the event. For example, undergraduate tickets for the Dave & Buster’s event on March 21 will go on sale March 11. If any remain, tickets will be available for graduate students the Wednesday before the event. OAD will also continue its free late-night movie screenings on Friday and Saturday nights throughout the spring semester. Movies are shown at 11 p.m. in Gifford Auditorium located in Huntington Beard Crouse (HBC). Free snacks are provided, and all movies are shown with open captions. To view the full late-night movie schedule, visit the Late-Night Movies website. OAD continues to partner with Recreation Services to host Late Night at the Gym from 11 p.m. to 1 a.m. Wednesday through Saturday nights at the Women’s Building and Flanagan Gymnasium. Late Night at the Gym is additional organized activities such as yoga, Zumba, badminton and more. To view the full schedule of activities for spring 2019, visit the Late Night at the Gym website. Don’t forget Late Night at the Rink on Friday and Saturday night from 9 p.m. to midnight. Recreation Services keeps Tennity Ice Pavilion on South Campus open late for SU/ESF I.D. holders who want a fun night skating. Visit the Tennity Ice Pavilion website for more information. For event details and ticket and transportation information, students are encouraged to visit the OAD website or email oad@syr.edu. Be sure to follow the Office of Student Activities on social media, @cuseactivities, for up-to-date Orange After Dark news along with other OSA news and events. Get Air! Trampoline Park, Friday, Feb. 15, 10 p.m.